Thanksgiving and Christmas were always my favorite holidays growing up. And it definitely wasn’t because of the presents. I like gifts every now and again, but they don’t make my world go ’round. Food, on the other hand, just might. Hams, pies, green bean casseroles, mashed potatoes, stuffing, turkey, rolls, all the endless leftovers (I really, really love leftovers! ), and even fruitcake. I’m all about holiday food! One that I’ve never been able to get behind, though, was sweet potato casserole. Not that I don’t love sweet potatoes. They’re one healthy food, in my opinion! 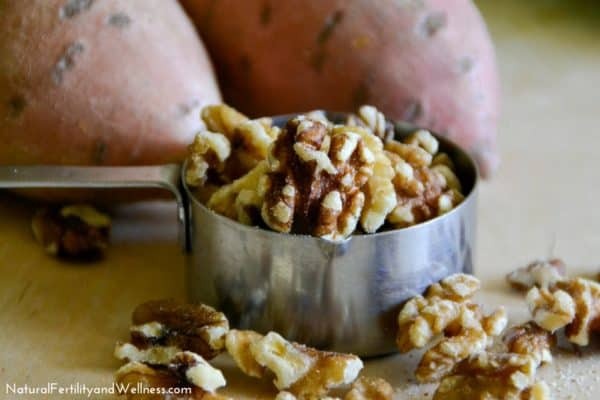 Sweet potatoes are full of vitamins and minerals your body needs to properly function. Among these are vitamin A (i.e. beta-carotene), vitamin C, manganese, copper, pantothenic acid, and vitamin B6. Sweet potatoes are also a good source of potassium, niacin, vitamin B1, vitamin B2, and phosphorus. With all that healthy goodness, sweet potatoes should definitely be making an appearance on your holiday table, but not filled with sugar and topped with marshmallows! 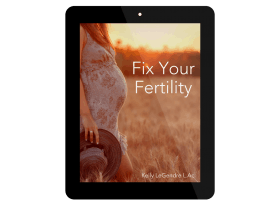 Unless you happen to make your own homemade marshmallows, which can actually be quite nutritious! But I digress, marshmallows and sugar ruin a sweet potato casserole in my opinion! 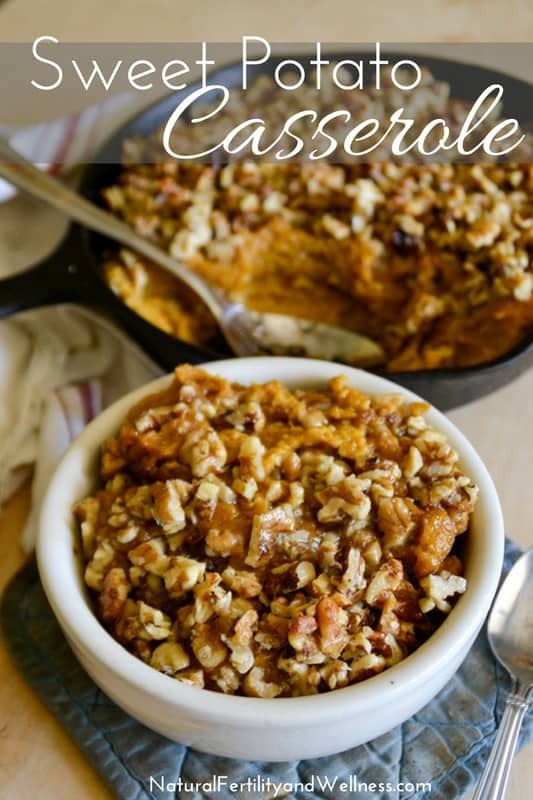 So I set out to come up with a delicious healthy sweet potato casserole that is just as much a crowd pleaser as those traditional sugar-filled ones! And I think I hit the jackpot with this one. 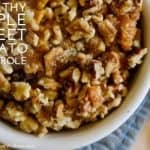 It’s lightly sweetened with maple syrup, filled with delicious spices, and topped with honey-sweetened walnuts! Not to toot my own horn, but when my un-sweet-potato-loving hubby chows down on the leftovers it must be good! My 6-year old said it tastes like pumpkin pie, and my 9-year old agreed with me that it’s even more delicious served cold. If you’ve been on the fence as to whether or not you should bring a sweet potato casserole to your holiday get-togethers, why don’t you try this one? All the deliciousness of that oft remembered holiday treat, with the health of sweet potatoes and walnut unadulterated by all the sugar! A healthy twist on this Thanksgiving staple. Roughly puree sweet potatoes with everything but the last three ingredients. Place in a well-greased 9-inch cast iron skillet or pie plate. In a bowl, cut in walnuts with coconut oil until mixed. 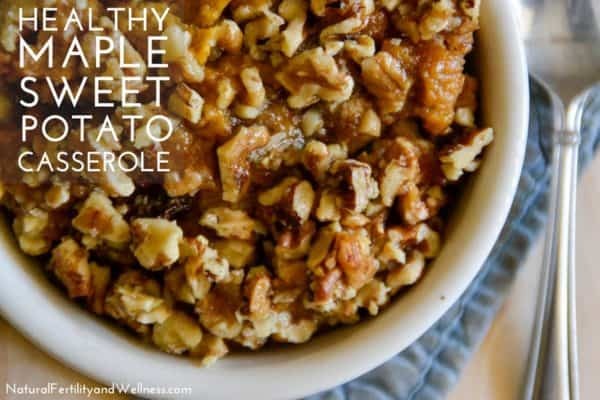 Stir in honey and crumble mixture over sweet potatoes. Bake for 25 minutes, or until topping is browned. Love all the ingredients in your healthier casserole. I find the combination of spices quite interesting and I can imagine making this sometime. Total agree sweet potatoes are packed with nutrients. I have never thought to cook sweet potato in this way, its very innovative. Sweet potatoes are very under used and packed full of nutrients as you say. Wow this is such a healthy casserole.. and very innovative. Thank you so much, Sandhya! Such a perfect sweet potato dish!! Yum! This sounds so good!!! I really miss sweet potatoes … sweet potato casserole was my favorite. I found out my body can’t handle them or potatoes, but I CAN make this deliciousness for my family to enjoy. Looks beautiful Raia! Thank you so much, Emily. I’m sorry you can’t enjoy sweet potatoes any more! I love the maple syrup and the walnuts. You have definitely hit the jackpot with this recipe!